Duchess Kate: Duchess Kate in Whistles for BBC Teen Hero Awards Reception! Duchess Kate in Whistles for BBC Teen Hero Awards Reception! 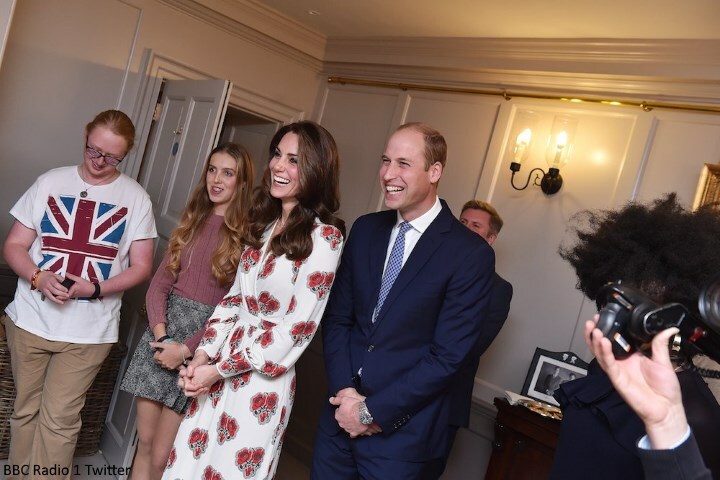 On Wednesday, the Duke and Duchess of Cambridge hosted a reception for the finalists of BBC Radio One's Teen Hero Awards at Kensington Palace. Since 2008 Radio 1 has held an annual event for teenagers aged 14 to 17 years. The awards celebrate the selfless, brave and exceptional achievements of young people. Celebrities and stars in the music, sporting and online industries are also honoured. The pre-awards event provided an excellent opportunity for the Duke and Duchess to meet the young people involved, and to congratulate them on their success. The couple posed for photos with young finalists. 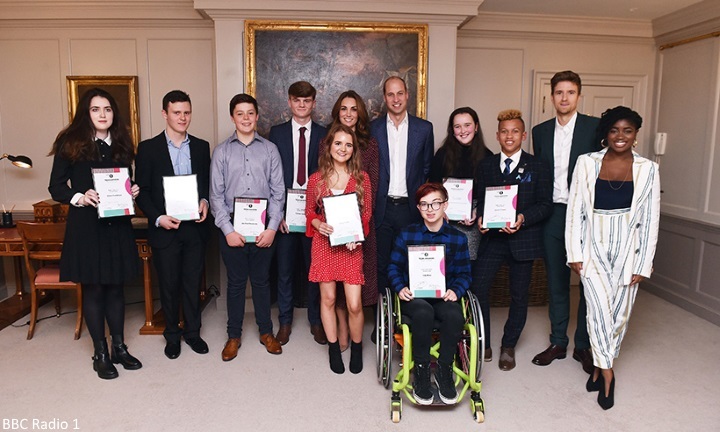 'It is thought that the royal couple welcomed teenagers - Lily Rice, Junior Frood and Siena Castellon - into their home to praise them for their inspirational work after being crowned Teen Heroes of 2018. Speaking to HELLO! 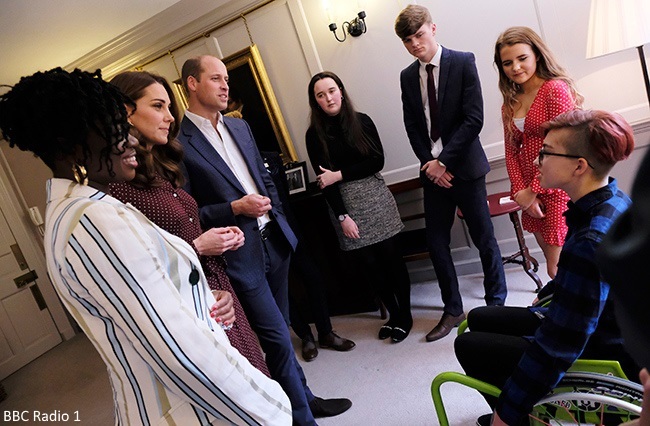 after the meet-and-greet, 16-year-old Siena - who has supported other students with autism and learning difficulties - revealed: "It was such an honour and privilege to meet the Duke and Duchess of Cambridge at Kensington Palace. They were both genuinely interested in my website, www.QLMentoring.com, which I created to support and mentor autistic students and students with learning disabilities." 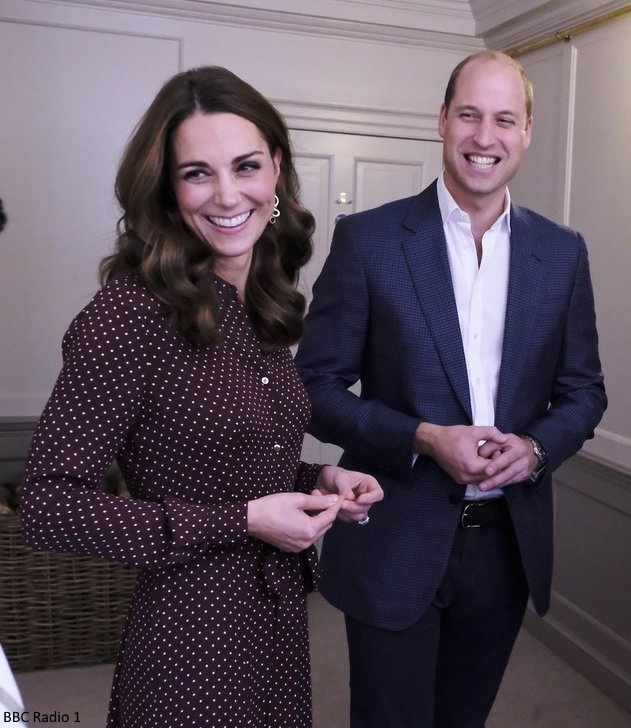 Of meeting Prince William and Kate, who wore a burgundy coloured dress with white dots, she added: "The Duchess was especially interested in addressing autism stereotypes and was saddened to hear about the severity of the disability-related bullying I have experienced. She congratulated me for being a Diana Award holder and for currently serving on the National Youth Board, a role that has given me a national platform through which to share my disability-based bullying experience. They were both incredibly warm, supportive and encouraging. Meeting them was an awesome experience! They have inspired me continue to make a positive difference in my community." Kate said to William: “You love breakdancing don’t you.” William replied “No, breakdancing is literally where I break myself. This is not the first time William and Kate hosted a reception for the event. In 2016, they welcomed young people and representatives from the awards to Kensington Palace. Kate, who wore a bespoke McQueen dress told, Joe and Toby, who were both active fundraisers for Cancer Research UK. "I don't know how all of you find the time to do the volunteering," she told them. "It's such a great thing... Keep it up." William added, "Massive congratulations, it's seriously impressive," before them the group of winners as "shining lights". 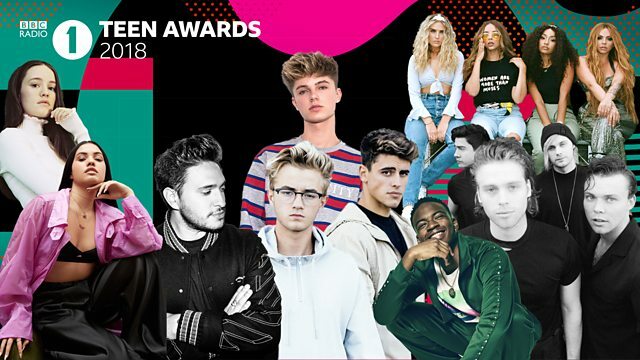 The Awards take place on Sunday at the Wembley SSE Arena. A host of well known faces including Little Mix, Jonas Blue, Sigrid and 5 Seconds of Summer will be performing. Kensington Palace also shared this video. The Duchess wore the Whistles Margot Dress for the reception. 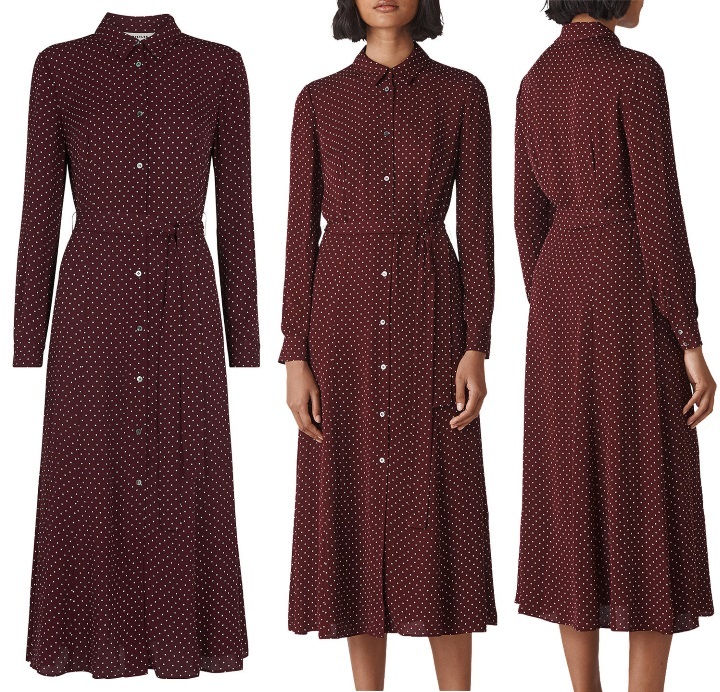 It's described as "Crafted from a lightweight fabric that elegantly skims the silhouette, this piece is adorned with a timeless all-over polka dot print and features long sleeves for a demure finish. The shirt design, complete with collar neckline with button through front give this a classic look." The £159 dress is available in limited sizes at Whistles, Bloomingdales, Selfridges, John Lewis and Next. 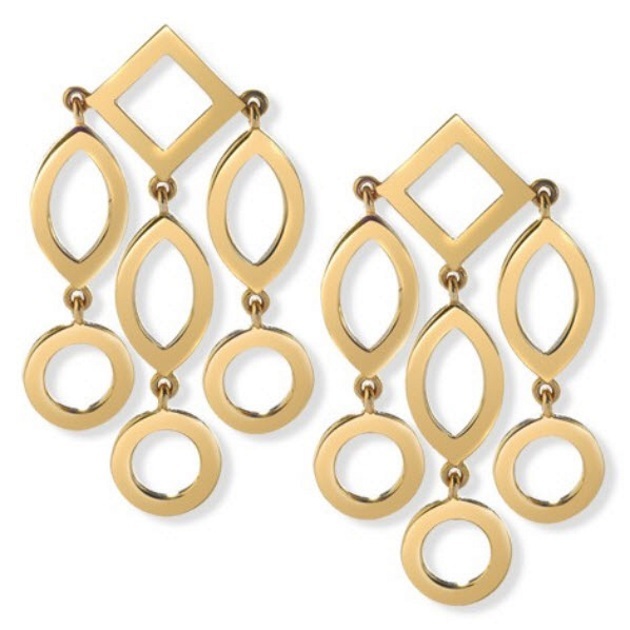 Kate accessorised with her Cassandra Goad Temple of Heaven Earrings. It's been a very happy week for the family filled with baby news. Congratulations to Pippa and James Matthews on the arrival of their son. He was born on Monday at 1.58 pm weighing 8lb and 9oz. Like Kate, Pippa opted for the Lindo Wing. The Palace said: "The Duke and Duchess of Cambridge are thrilled for Pippa and James." 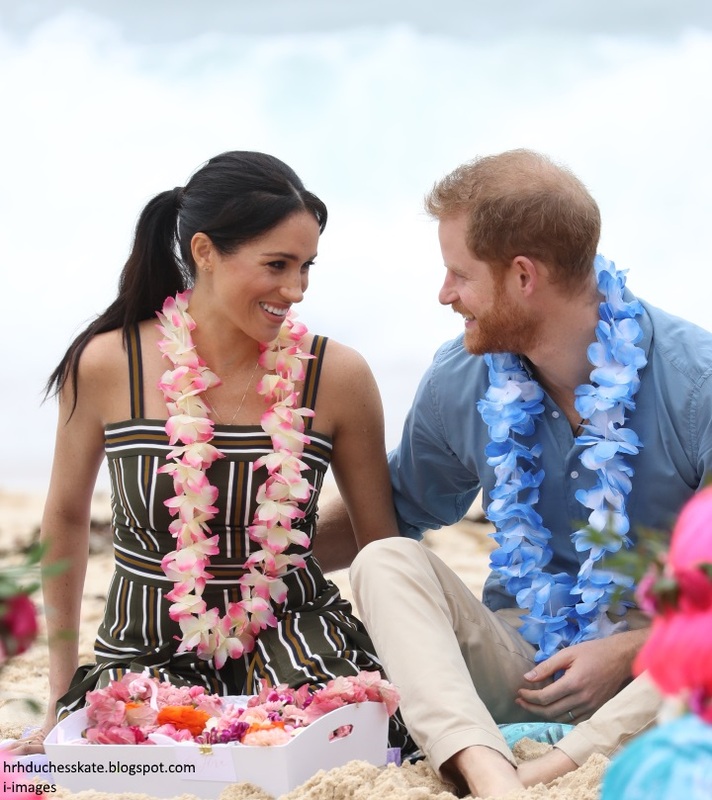 On Monday, the Palace released delightful news confirming the Duke and Duchess of Sussex are expecting their first baby in Spring 2019. The couple are currently undertaking a packed tour of Australia, Fiji, Tonga and New Zealand. Read all about it over on Mad About Meghan. At present, there's no engagements announced for Kate. George is on half term until the 29th, it's possible the family will spend a week at Anmer Hall. In the meantime, there is a strong possibility we'll see the Cambridges at the private luncheon and/or State Banquet for the Dutch State Visit on Tuesday. She looks so happy. There a lightness there that wasn’t there before—she seems more confident. And that makes her even more beautiful (if that is possible)! I so agree. She seems so happy. And that makes me happy. Shantel, you stated it perfectly! She looks so confident and relaxed since she returned. Thanks, Charlotte for the post as I check your blog often! I think she feels confident again after gettong back to her usual shape. Every time she is pregnant, it takes her a moment to look confident again. Oh, theh said Pippa gave birth on Monday, even if it was announced in Tuesday. I agree. She seems comfortable, content and confident with her role and life! Wonderful to see! Agree! I notice her comfort & confidence after each baby. The first time I noticed a significant jump in this was during their Australia tour. Hope she isn't working too much & still getting enough rest with the new baby. Yes, it’s great to see a very happy Duchess! She looks lovely & her & William are so warm to others. After Louis’ birth & all the other big family events happening, they seem to have grown closer & more content. It helps that George & Charlotte are set into a routine, so she can enjoy spending quality time with Louis. I do hope they have another little one in the future to coincide with a Baby Sussex 2/Baby Matthews 2...maybe I’m getting ahead of myself there! I haven’t seen that many pictures from this reception, but I like the dress, from what I can see of it. It’s very autumnal. Oooh thanks for the quick look. She looks great. Kate looks so happy, definitely enjoying this engagement! The dress, from what we can see looks like a good solid staple for her wardrobe. I have a navy, short-sleeve version of this dress! That makes me so happy! Haha. A very worthwhile and important issue that is being tackled here. I can see that Kate dresses well, but not in anything that will take away from the event. She is very clever. It is nice to see both William and Kate onboard this together. Charlotte you must be exhausted ! Thank you for covering this event. I loved this dress, it looks comfortable to wear. I agree Shantel that there is more confidence and ease in Kate. Maybe some pressure is off becuase she has her new sister-In-Law, Meghan? I think there is definitely a lot of pressure off because not all eyes are on her anymore! I as thinking the same thing. Those are my thoughts, too! Less pressure on Kate with Meghan in the family now. And perhaps the Cambridge family is complete, so no more HG to suffer thru? She looks radiant. @Charlotte: I'm relieved that Kate hasn't had too much to report on as of yet while Meghan is on the royal tour....I was worried about your already overflowing plate! Thanks so much for all you do! It's also possible that Meghan may have been able to bolster Catherine's confidence by sharing tricks of the trade developed over many years of auditions, speeches and red carpet appearances. Catherine didn't develop into a full and autonomous professional woman prior to her marriage. She did that in the public eye and endured all sorts of push back. I can't imagine learning my job responsibilities and developing any professional aplomb with a camera lens on me or social media hatchets out for me at every turn. Philly, I think Kate has done quite well on her own. I've always thought that her humility and gradual increase in confidence has been endearing and refreshing. Just because somebody is confident that doesn’t make them less humble. There is a big difference between confidence and arrogance. I am shy like Kate but my younger sister, mom, and dad are all confident my nature and the most humble people I know. Confidence and humility is not mutually exclusive. Iloveelephants, no argument from me. My point was that Kate has done just fine and her sincerity is endearing. Kate looks good. I love joint engagements for W&K. The dress is fine, not special. We all have them. It is an easy go to. Reminds me of something one would wear to the office. Kate always wears long sleeves buttoned to the wrist.. I think long sleeve dresses have a little more punch to them when the sleeve is shuzzed or rolled showing about 6 inches above the wrist and a pretty bobble on her arm. Kate looks beautiful! This post is a nice surprise. It's incredible that you could find the time to cover this event considering the hard work you're having with the australian journey. Many compliments to you, Charlotte. A curiosity: one of the ladies involved in the event is called Siena. I come from Siena. I didn't know it is a name as well! I second your words, Silvia - thank you for finding time for this post, Charlotte! Even though I get my daily dose of royal news through MAM, I'm happy to read about Kate again! I went to the website created by Siena Castellon, and I was very impressed with her work. Very glad to see the royals highlighting such work by these inspiring young people. Kate and William look happy and are good at cheering on this type of effort. We need more of this kind of thing here in my home area. Was this engagement announced before ? Were these pictures from 2016 published before ? Very nice to see them again! William is working in his lowkey standard way and nice to see Kate have a few engagements! Makes sense that they have a fairly low profile with the Sussexes taking center stage for a while. Nice timing with the kids holidays as well! Nice workday dress. I have a soft spot for polkadots so I was bound to like it! And those earrings are a favourite staple of hers that I've always liked! I feel the same way about Charlotte's blogs. If I see headline anywhere else about an unexpected Kate engagement, I don't even look at it because I immediately come to this blog because I know Charlotte will have it all covered. I am looking forward to this blog continuing through Kate being Queen. It is always delightful to see William and Kate working together. I love the dress and her hair looks wonderful, I like those soft big curls. A very nice work day dress for the future Queen Consort. Reminds me of styles I wore to work in the 90s. It’s easy and suits her. This is a worthy cause. I love that name Dorian!!! I wonder if catherine is enjoying the fact that Meghan has taken some of the spotlight. She does look so relaxed, and perhaps with the media focus divided a bit she feels she can enjoy her family without quite so much attention (or at least she has another person in a similar role for the first time). Catherine must be constantly aware that for her and William, and their children, the job will inevitability get bigger in the future, interest will never ease...so this time is probably very welcome. Pippa and James's child was born on Monday UK time---around 6 am Tuesday, Sydney time. They kindly waited until Tuesday UK time to release the information. James had been spotted at the Lindo Wing, which set off speculation. I don't know if a personal announcement has been made yet. Harry and Meghan arrived in Sydney around 7am Monday local time.However it was still Sunday in the US and Canada and I think the UK . There is about 16 hours difference in time this time of year for parts of US and Canada. Harry spoke later and referred to choosing to make the announcement in Australia; however, the news had already been released by KP when he gave that speech, I believe. Keeping track of multiple persons in multiple time zones doing many interesting and breaking news sorts of activities could confound the cleverest of scribes. Your head must be whirling by now, Charlotte. I am imagining Mr. Charlotte standing at a large wall chart with pointer and Sharpie in hand whilst you call out," Harry and Meghan are on the plane to Australia! They're expecting! James is at the Lindo Wing with suitcase in hand! Harry and Meghan have landed! Pippa's given birth!...! Kate and William had a reception!...." And then finding out that, between communication means, time zone variance, and embargoed engagements, that it is fruit basket upset. The baby was born around midnight Monday, Sydney time, not 6 am. I think! Charlotte, you are *phenomenal* keeping both blogs current so quickly! I hope you're getting some sleep along the way! Thank you so much! I’m enjoying the dress and as usual, the Duchess of Cambridge looks lovely. It is a good move on behalf of the young Royals to host the finalists. Being at Kensington Palace and talking with the Royal Highnesses has to be inspiring to these young volunteers. Thank you, Charlotte. I am glad KP eventually officially recognised the engagement although after it had already appeared on line in many of the papers. What these young people have already achieved is incredible and they really deserve the recognition they have been given. It was clear from the photographs and the short video that W & K were so very good with them they all appeared to be enjoying themselves and totally at ease. I thought both W & K dressed appropriately for this function smart but not too official. I really liked Kate's dress both style & colour I would think it will have a lot of wear this Autumn. I always enjoy W & K on joint engagements I hope we have more in the coming weeks. I feel that Kate has appeared far more confident and relaxed since her new Private Secretary came about a year ago this coincided with William becoming a full time royal and I do wonder whether she is now more settled in her role of supporting William along with her own charitable work whereas previously William was part working in the Air Ambulance along with very limited Royal Work and by his own admission those 2 years had not worked as well as he had hoped so kate had little guide lines as to her role other than look after 2 children and some public engagements which living in Norfolk was not easy. I hope they attend the State Banquet for the Dutch Royals. @Mary E: Wonderful post. I think you have perfectly hit the nail on the head. Both Kate and William have grown exponentially in their roles since September 2017 and I also think it's because of the move to full time Royal status. I think living in Norfolk and being part-time Royals left them in a confusing grey area and slightly discombobulated sometimes about their role. They were living in two very different worlds and roles with-as you said-very little guidance as their position as adult third in line to the throne is a rather unique one. I especially noticed this after Charlotte's birth where I think they (particularly Kate) were struggling with juggling two very young children and their slightly vague role. This time around with Louis they are settled in one place with one role; both George and Charlotte in nursery/school with structured routines and I think it's easier to know where exactly they stand. I also 100% agree about Catherine Quinn since she started last autumn. Kate made a great choice hiring her. I think she has been a steadying, mature and intelligent influence by Kate's side as she grows into her role. I saw a post previously that Rebecca was fine as a starter Private Secretary but Kate needed someone with more experience and knowledge as her role grew and Catherine Quinn is perfect. Even her persona at engagements is so different to Rebecca. She just emanates a cool, calm professional confidence in the background whereas I often felt Rebecca looked a little flustered. I would also like to nominate her to be Catherine's new style advisor when Natasha goes on maternity leave as she always looks fierce! I also noticed in the 2017-18 Sovereign Grant Annual Report that Catherine Quinn was appointed to the Lord Chamberlain's Committee in March 2018 to join the Queen, Prince Phillip, the Prince of Wales, the Duchess of Cornwall and William's (appointed in March 2017) private secretaries which indicates how much faith they must have in her abilities and also indicative of how the role of the Cambridges is growing. 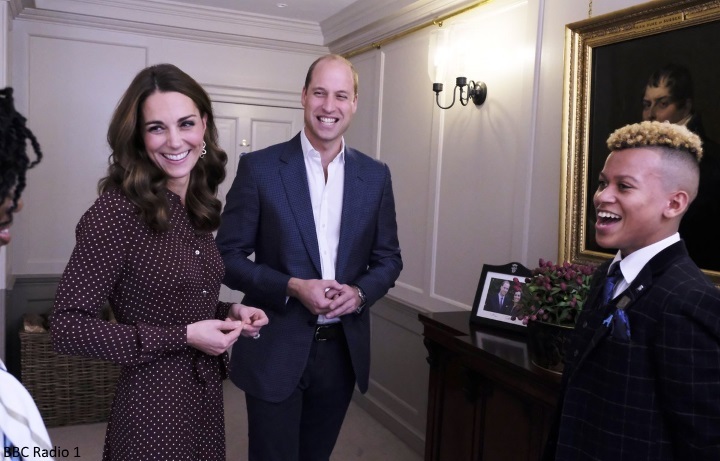 Likewise, I've noticed William's new Private Secretary is having a lot of positive influence and using his senior civil service connections judiciously because a lot of William's engagements have a more offcial .gov connection recently. I agree with all you said. A very good analysis. This is a lovely engagement. Kate looked very appropriate - dressing in a low-key way to allow the emphasis to be on those brave young people. Thank you for your thoughts, Mary E -- they provide some good perspective. For my part, I thought it was long past-due that they moved to London and became full-time royals. It must be easier that way, as you said, to know where they stand. Although, I think they probably could've figured that out long before. I'm glad to see William stepping it up and taking on more engagements. I just never understood why they kept putting it off for so long. Good comment, Sunny. I do think the new, highly competent secretary was hired because HM and TPTB had plans to enlarge William's role rather than William increasing his role because of the new secretary's influence. William has specifically said in the past, when asked about plans for increasing duties, that he was ready to increase duties and was waiting for the Queen to act. Apparently she has and he has (with the DofE's retirement )Since then both he and Harry and other royals have made it clear that HM still rules the roost. Same for choosing Catherine Quinn for Kate. Ms. Quinn was selected with an eye to future roles. Both William's and Catherine's new assistants have monarch-assistant-level resumes, in my opinion. It has been clear from official statements that Catherine's primary focus will be with their children and with her charities and patronages, while assisting her husband in his work. There was a very clear delineation in their respective roles, as far as official royal engagements are concerned. Personal charity choices and official royal work, other than patronages, have always been considered separate matters. It seems, from the sketchy information we have on Kate's childhood mental health initiative planned for roll-out the first of the year, that it might involve more work that can be done from Kensington Palace (board meetings, organizational and informational conferences, receptions, correspondence...) so she can be close by for the children's needs and the school runs, while still running the new program. Working from home is a respected concept. William's increased duties in support of the Queen will increasingly take him away from home. Those who are anticipating her traveling about on engagements away from KP frequently may be disappointed. The plan has been clearly stated--more than once. I think any increase in energy or perceived confidence is at least partly due to her having the confidence to begin with to not just talk about the importance of parenting but to insist on living her words. This goal is nothing new. She has talked about it for years; now, she is just putting her ideas in action both for her own family and for other families, through the new initiative she is working on. There is often a calmness that comes with such decisions. And, no doubt, confidence. That video with William talking about break dancing is hilarious. That was so sweet! They really put those young people at ease. This post is a nice treat. And Kate's dress reminds me of the suit she wore to the Garter ceremony in 2008. Nice to see them out and about. Great engagement. The kids look thrilled to be honored. Appropriate and standard dress that somehow looks fantastic on Kate. I think impeccable tailoring is the key. A fun, easy print. The style of the dress is almost exactly like the one she wore to this event before. Her hair looks lush and she seems relaxed and happy. I do wish we'd see her more, but I don't think that's likely to happen. I loved that suit. With the broad-brimmed black hat.She also wore it to sign a condolence book. Is that the one? In my head I see a polka dot dress she wore while pregnant. Not the black and white wizard wand one. Not the Azos one.The one that was midi with front plackets, short-sleeved. Probably around November, 2017? I can't find it. Am I imagining? Yes yes... she did wear it to sign a book of condolence. These two dresses are quite similar. I notice in the article photos that the dress has the full skirt and raised waistline that helps accommodate or down-play early pregnancy. That, along with clasped hands at tummy level and carrying flowers strategically placed. And limited or obstructed side-views. Teddy bears work well, too. Ahh, I’ve missed you, Kate! Lovely dress & engagement for her & William. Hopefully we’ll see them both at the Dutch state banquet. Aww...Pippa & James + Baby went out for a stroll. They look so content (the dogs, too!). Nice to see Carole still shares clothes with Kate - the Boden coat. They are so genuine and lovely to the people they meet. I loved hearing William reference his mother as well. If Kate and William attend the Dutch state banquet tomorrow, I hope to see her wearing the royal order this time. I wonder why she hasn’t gotten it yet. Marie Claire online has a roll call of 95 of Kate’s outfits, a “best of” chronology. It is fun to look back and marvel at Kate’s fabulous use of color and variety of styles. It appears that William and Kate are confirmed guests at the State Dinner tonight...any word yet Charlotte? Can't wait to see the pictures. this may be off topic here, but wondering...has Camilla been given the Royal Family Order by the Queen?